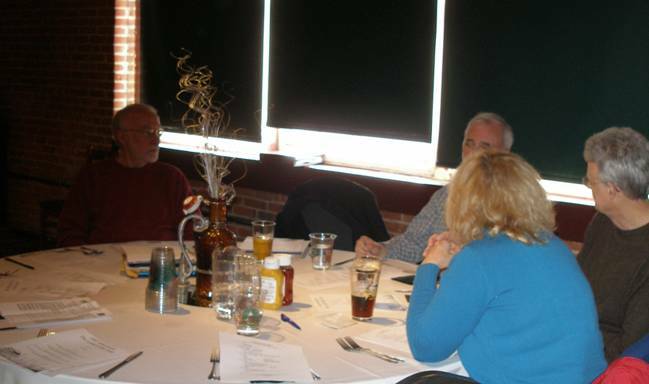 We officially kicked off the 2014 season with our January membership meeting at Gilligan’s yesterday. The weather cooperated and we had 24 members attending. (but, no old LBC’s….hmmm…) We have a full schedule of events planned for the coming year. 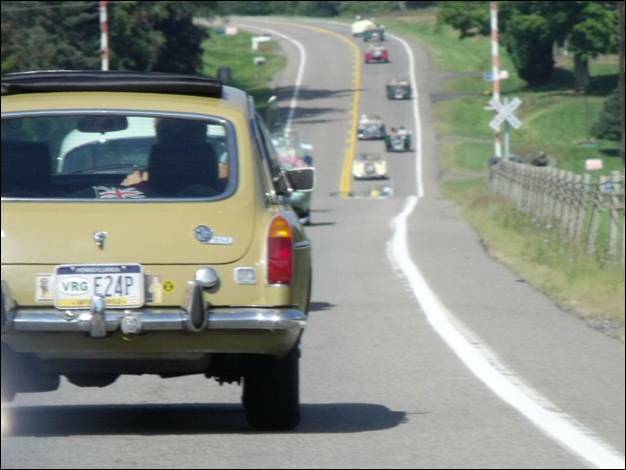 There are road trips to national events at MG2014 in French Lick, NAMGAR GT-39 in Ottawa, Watkins Glen, and PVGP to celebrate our LBC heritage. 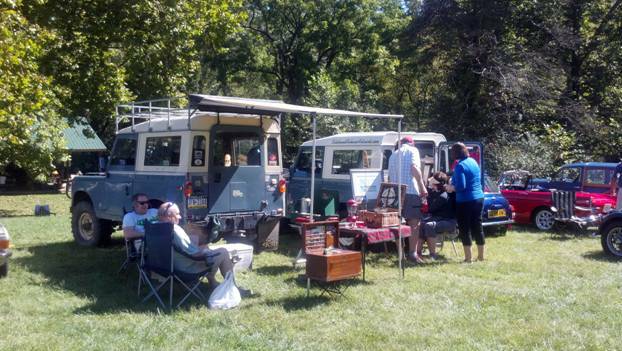 We’ll continue with our Coffee – Cars & Conversation the 1st Saturday of the month from April thru October and several other excursions through the year. Lots of good reasons to get out drive your car and keep the marque(s) alive and well. 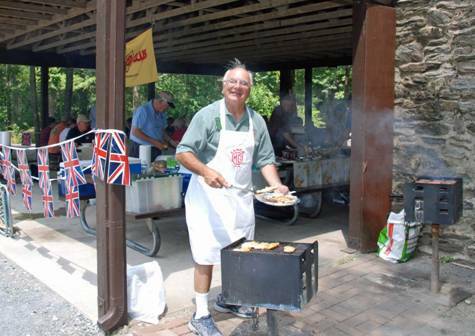 In July we’ll recognize our club’s volunteers with a BBQ and baseball game and on July 13th, we’ll hold our annual “British Invade Gettysburg” car show. 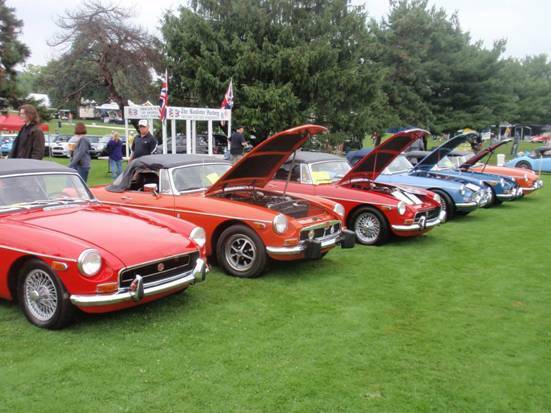 This August 24th, we’ll celebrate the 25th anniversary of our “A Taste of Britain” car show. It’s quite an accomplishment and a real tribute to the club’s members to keep two car shows up and running. Over the years, I’ve had the great opportunity to be part many volunteer groups from civic to church and professional organizations. As I learned from my days in the Jaycees (I’m dating myself) it’s easy to manage people at work, but takes much more skill to motivate volunteer groups. The secret to success is a shared common interest and goal. That’s what makes our individual and collective clubs so unique yet so much the same. Our shared interest in British cars, our desire to keep the Marques alive and well and the friendships we’ve developed over time. The common bond we all share is like a fraternity and is demonstrated every time we go to a show or an event and strike up conversations with new friends. It’s a new year and a good time for resolutions. Good time to look at your club and resolve to get active, lend a hand or just drive your LBC more often this year. The collective value of our efforts will insure our success for years to come. One of the best quotes I’ve ever read was “my biggest fear was not that I set my goals too high and missed, but I set them too low and achieved them”. We have an active year planned for LANCO, some things will go well and some things won’t go as planned…..in any case I know we’ll celebrate again at the annual banquet in 2014 and then do it all over again next year. It’s that common bond thing we share at LANCO! Remember to check out our web site at www.lancomgclub.com and mark your calendars for the upcoming events in 2014. 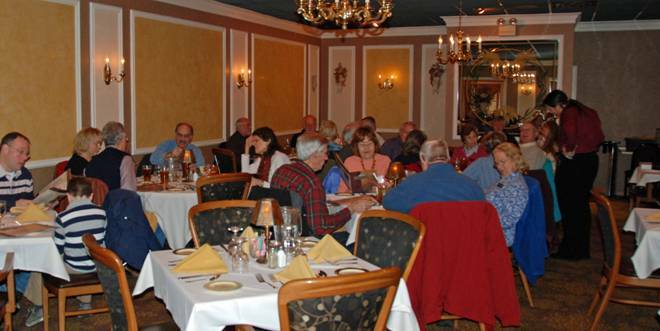 The annual LANCO MG Club Holiday Banquet was held at the Fireside Tavern, Strasburg, PA on Saturday, December 7th, with 54 members plus two guests from Toys for Tots in attendance. 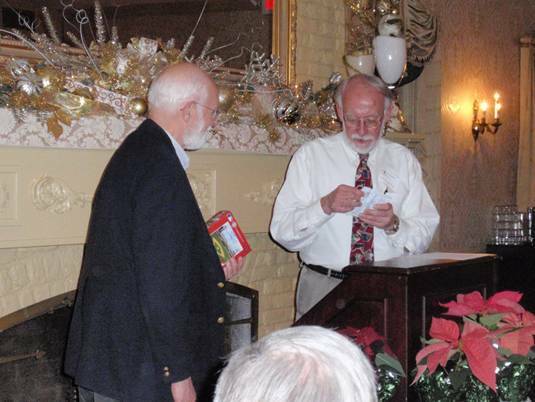 A donation was made to the Lancaster County Marine Corps League Toys for Tots program. In November we also donated to the Toys for Tots, Gettysburg. 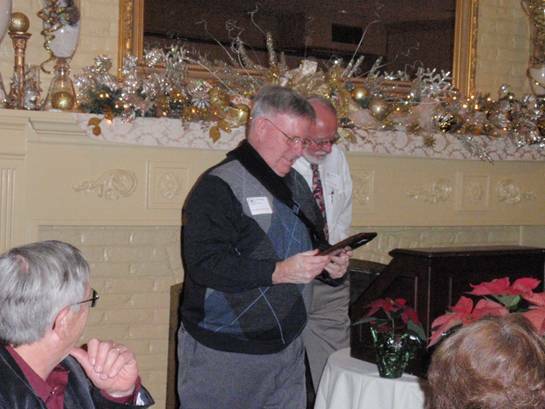 This year, the “Enthusiast of the Year Award” was presented to George “Skip” Partlow. 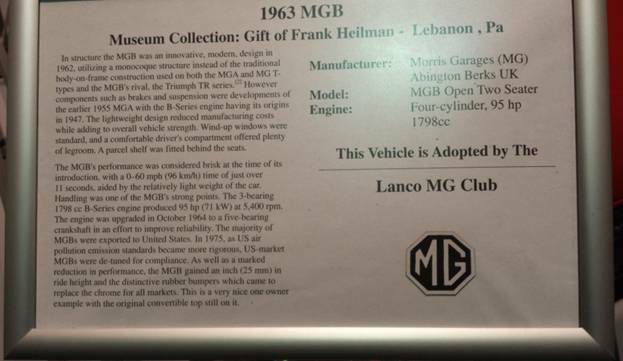 The “Actually Setting the Record Straight on LANCO’s History Award” went to Gloria and Larry Ciarrocca for identifying an error in the Club History as presented on www.classiccarcommunity.com , which reads “Lanco MG Club founded by Gloria & Charles Ciarracca …”. 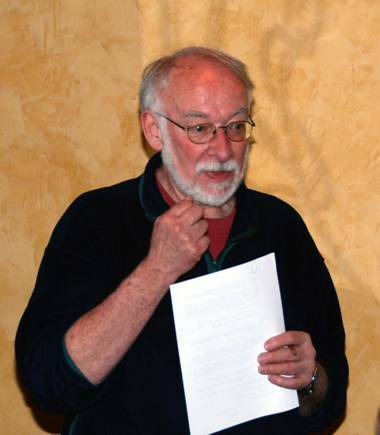 The “Stepping up to the Plate Award” was presented to Forrest Collier for suggestions and ideas to help the club, writing a British Marque Article and organizing the Cal High tour. 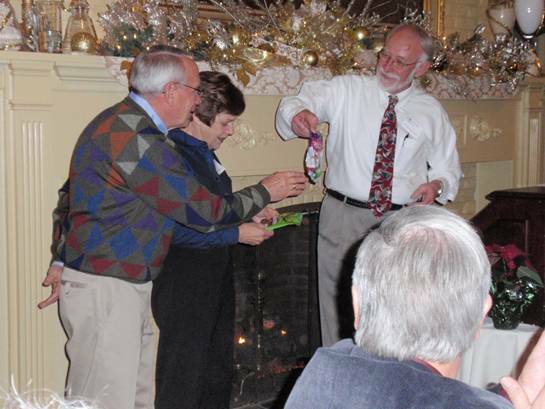 The “Early Bird gets the Worm Award” was presented to Andy and Kay Myers for saving LANCO for an embarrassing situation. 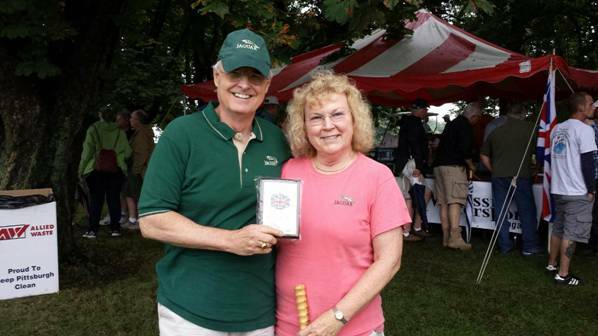 The “LANCO ‘Tenacity’ Award” was presented toBruce and Sue Hurley for their tenacious driving to the Pittsburgh Vintage Grand Prix whilst surrounded by somewhat less tenacious individuals!! (and we “know” who we are). 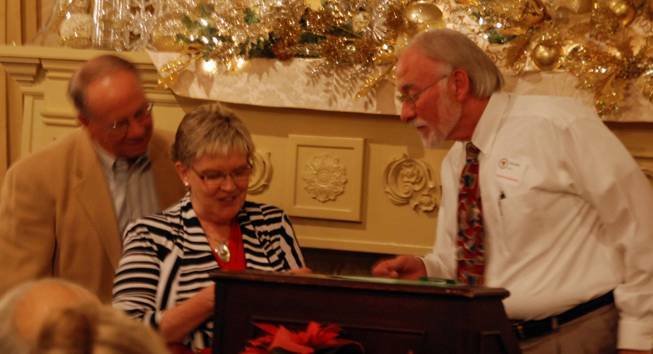 The festivities concluded with the annual carol sing led by Sally, accompanied by Bruce Deisinger, and a reading by Joan Martin. Another enjoyable end to a successful year! WOW, it’s been cold and snowy and then it gets colder and snowy again. If I get my hands on that groundhog he won’t have to worry about seeing his shadow again!! He’ll be somewhere in the weather man where the sun don’t shine! (sorry if I offended any winter aficionados) Any way, in true winter panic form, I had to postpone the last club meeting based on the pending “big” one. We were supposed to measuring this one in feet and not inches. We got about 2 inches of snow and since I’m writing this BEFORE the rescheduled meeting, we’ll see if it was a good decision!!! 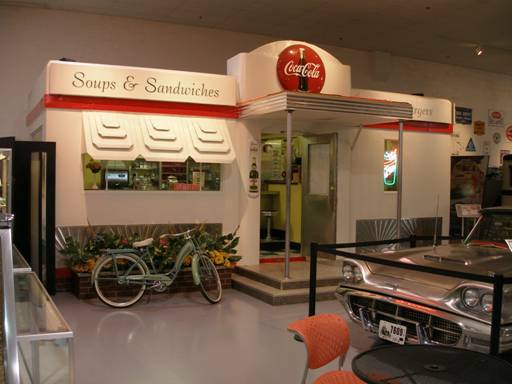 We’re planning a box lunch meeting for February at the AACA Museum in Hershey. And when I do put it all in perspective, we’re really quite lucky to have a venue like that so close to home to host a winter meeting. 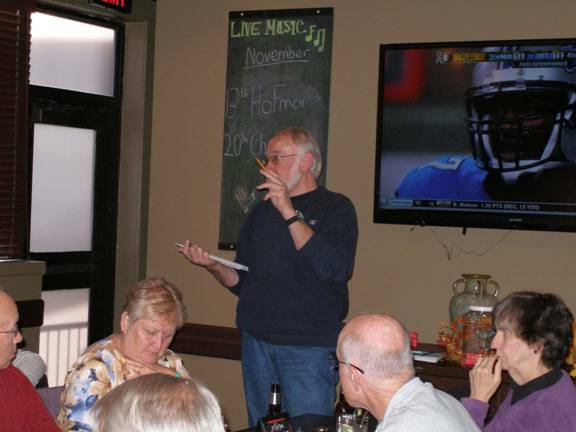 Wish us luck…..
We reviewed the 2014 calendar at the January meeting at Gilligan’s Restaurant. We had a good turnout with approximately 25 members attending. We’ve got a busy year ahead of us and it should be made that much sweeter after this winter. Did I mention that it’s cold and snowy?? This may surprise some, but I’m going to ramble in this message! A couple of things have impacted me this past January. First, I did install some level of heating in my garage where I store my harem. I enclosed the shop/work area and moved my 1959 Bugeye in there. It’s been a work in progress for three years and I actually planned to sell it this spring as I lost interest in finishing the project (strike a nerve with anyone else out there?) I’m not sure I actually lost interest or just lost my way as the body work and paint job on the car are outstanding and I was afraid to work on it, so it sat fallow for three years. After some prodding from my family I started to reassemble the Bugeye in my heated work shop. I can actually get the shop up to 60 degrees and very comfortable. 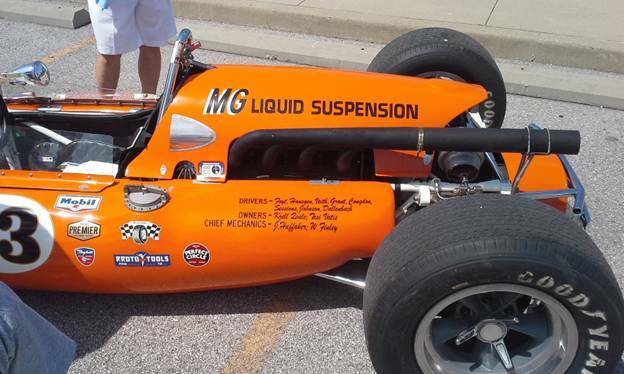 Guess what - after years the car is now a rolling chassis. All the suspension, hydraulic lines and steering are hooked up. It’s on its way back to being a sports car again. In the re-assembly process, I did drop a wrench on the paint and made a ding. Guess what, both the BE and I survived the event and seemed to prosper. The March Meeting will be at The Appalachian Brewing Company in Harrisburg on the 9th at 3 PM. Hope to see you there. Also, remember to check out our web site and mark your calendars for the upcoming events in 2014. Lots to catch up on since I posted our last club update. 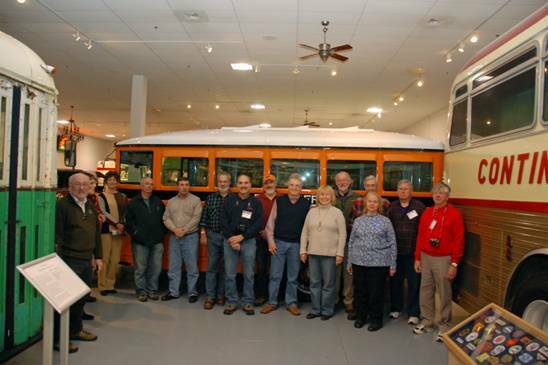 First, we did have our February meeting at the Antique Automobile Club of America (AACA) Museum in Hershey. What a great venue to host a meeting. 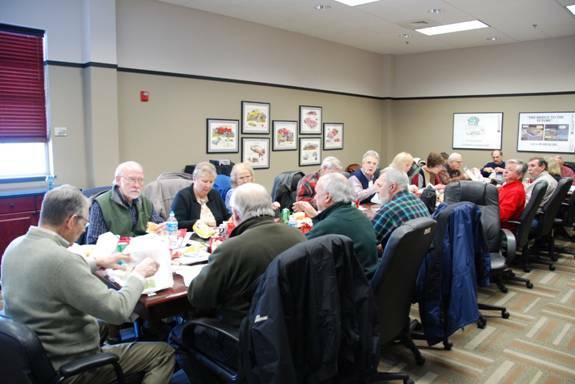 Mike Patterson was very accommodating and arranged for the box lunches and the use of the board room. Next, “Tiger Tom” Earhart agreed to be our tour guide IF we provided some food…..no problem. The lunch was great and the tour was outstanding. 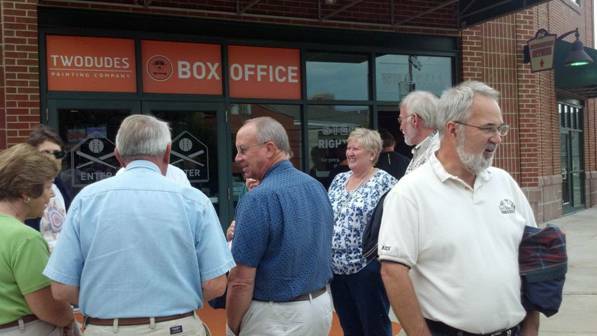 The museum is really a 1st class venue staffed by an equally 1st class group of volunteers. If you missed the meeting, I’d suggest you try to visit the museum at a later date (http://www.aacamuseum.org). 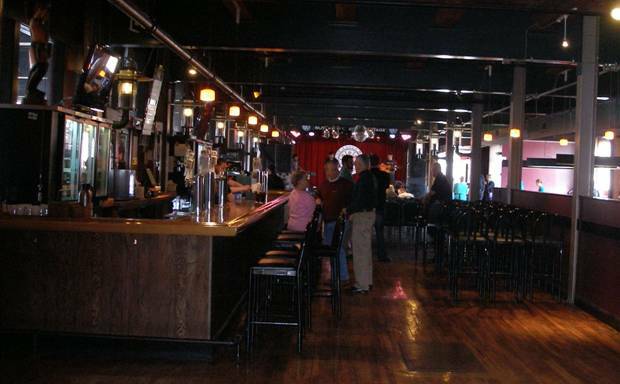 Next we held our March meeting at the Appalachian Brewing Company (ABC) in Harrisburg on the 9th (http://www.abcbrew.com/brewpubs/harrisburg-brewpub). The venue was great; the food was delicious; and, guess what - the beer was good! What a winning combination, unfortunately the attendance was short of our usual norm. I’d appreciate any feedback from the members not attending as to why the venue did not work. Possibly just date and or time conflicts, but the feedback is important for future planning. Our April meeting is a bit early due to the conflicts with Palm Sunday and Easter. We’ll be meeting on April 6th at 3 PM at the Lyndon Diner in York. We do have some key business issues to finalize at that meeting, so hope to see you there. 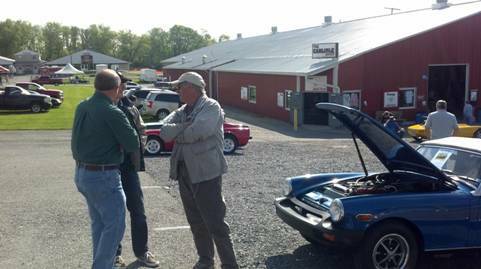 We’ll also kick off the season's 1st Coffee – Cars & Conversation on April 5th at the Turkey Hill Experience in Columbia. This is our second year and we’ll meet in the parking lot at 9 AM for about an hour or till the last guy gives it up…or the coffee starts to work its magic and everybody needs to hit the bathroom! FYI – we are outside soooo dress appropriately for April. We should be able to stand around in the lot and watch the last piles of snow melt with sadistic delight. We’ll also have our 1st planned tour of the season on Sunday, April 27th as we’ll visit the National Watch and Clock Museum in Columbia. We’ll meet at the museum at 2 PM and do the tour and I think I can find a place for ice cream after the tour to help pass the time. Had to dig deep to try and work some kind of time pun in there! The driving season is ready to kick off and I can’t tell you how excited and ready I am for winter to hit the pike. We held a board meeting in March and as I was discussing my Bugeye restoration with Charlie B, he reminded me of the British v. US spec fuse values. We did present this at the March meeting and feel it deserves a review. I’ll use my Bugeye as the example. I’m in the process of installing the new wiring harness and the system is designed with two 35 amp fuses. Now these are British spec fuse values. If you replace them with typical AGC/US spec fuses you’re going to have a problem. The equivalent US/AGC fuse value should be about 20 amps - quite a difference. And an excellent opportunity to let the “smoke” out of the system and trash Lucas, as we all like to do. Unfortunately this would be operator error. Which leads me to my soapbox - I actually find these messages quite cathartic to write, but I digress. 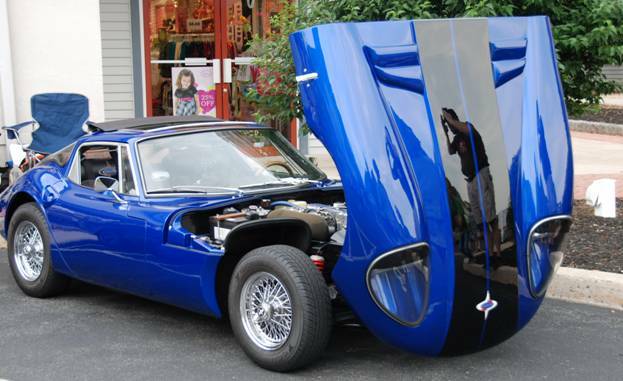 Our little British Cars (LBC’s) are quite the compilation of design and quirks. You’ve got to work at it to keep them on the road and over time you grow to appreciate the quirks and the joy they deliver. Now our respective clubs are no different. We’re a compilation of design and individual quirks and we have to work at it to keep the club running and if we do, it brings us a lot of joy and some great stories to swap. My gems to share this month are, work on your club to keep it running. It’s well worth the effort and will reward you tenfold. Don’t take any of this or yourself too seriously. We’re all some form or type of a quirk. We just can’t see our own. Finally go check your fuses and don’t blame Lucas for operator error. Finally, remember to check out our web site and mark your calendars for the upcoming events in 2014. The basic layout for the Museum consists of a chronological tour from the beginnings of the automobile through modern times. There is a large collection of busses in the basement area, along with a restored example of a 1940’s diner (as manufactured by the Valentine Manufacturing Company of Wichita, Kansas). A portion of the museum area is reserved for rotating displays - such as the “Art of the Build: Rods and Kustoms”, which was in the Museum at the time of our tour. Also on display was the 1986 Rolls Royce Silver Spur factory Limousine which was once owned by famed music icon, the late Whitney Houston (and which was donated to the Museum by an anonymous collector), as well as a stainless steel 1960 Ford Thunderbird (created by Allegheny Ludlum Steel Division and the Ford Motor Company). 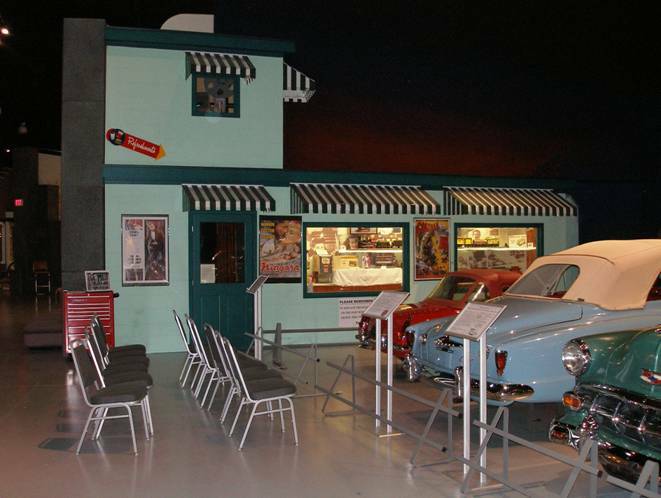 Starting in October 2014, the Museum will be host to a permanent display of the world’s largest and best-known collection of Tucker 48 automobiles, engines, mechanicals and automobilia from Tucker historian and collector David Cammack. 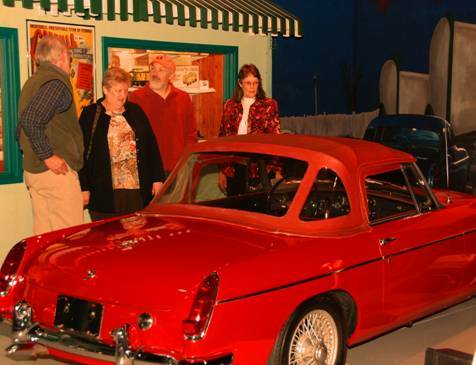 Parked as part of a drive-in movie display was a red 1963 MGB – supposedly the first “B” delivered by Ladd Motors of Lebanon, PA. 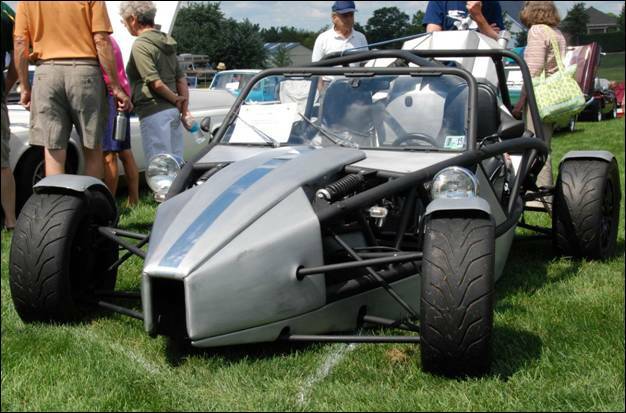 The “B” is one of several MGs in the Museum’s collection and is available for “adoption” under the Museum’s “Adopt-a-Car” program. 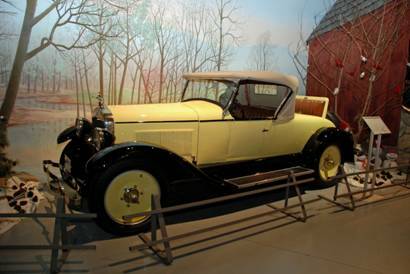 According to the Museum’s website, “By adopting a car you provide some financial support for the up-keep and maintenance of the adopted car. A contribution of $500 (tax deductible) will help support the car for one year. Your contribution will cover some of the costs of insurance, any required mechanical work, supplies to keep the cars in show room condition, and other costs.” Such an “adoption” was discussed at the March meeting and will be discussed further in April. The Group Waits for a Bus? 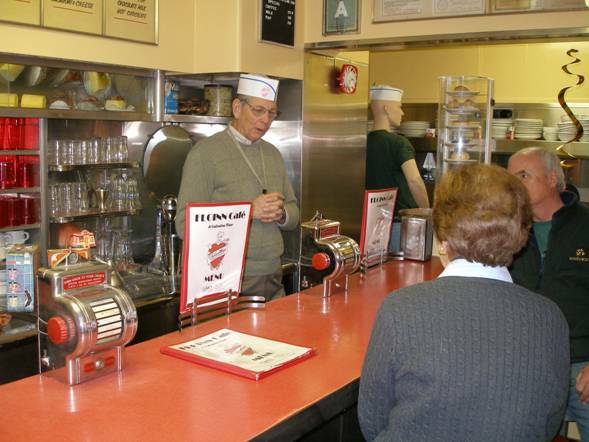 The April meeting at York’s Lyndon Diner was a huge success. We had 25+ members attending and it didn’t hurt that the weather was very nice!! I think everyone is just relieved that we all survived the winter of 2014. Now if we would have had just one more member present, Donna Dencler, she would have won the $30 name tag drawing, but alas we were one member short. It was a very busy meeting as we had several business items to discuss. After much evaluation, aka procrastination, I actually finalized the fire extinguisher recommendation. We’ve settled on a 2.5 lb. halotron unit from Ammerex. The best pricing was found on eBay and included free shipping. Now just to remind everyone, when you present your receipt to the club, we’ll reimburse you $10 toward your purchase. The final cost should be approximately $80 for the unit which makes it a VERY good buy. A fire extinguisher is like insurance or any of a host of items that really don’t matter until you need one and then they are worth their weight in gold. I’d recommend you don’t drive your LBC without one……nuff said! No Name Tag Winner Again! 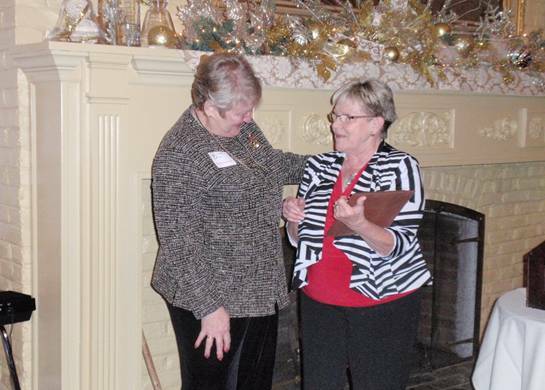 This year we will be resurrecting our volunteer recognition program. We’ll be holding our recognition at the Lancaster Barnstormer’s ball park and enjoy a chicken BBQ and cross town rivalry between Lancaster and the York Revolution. The date is Tuesday, July 29th. So check your email and save the date to be LANCO’s guest at the ball game. 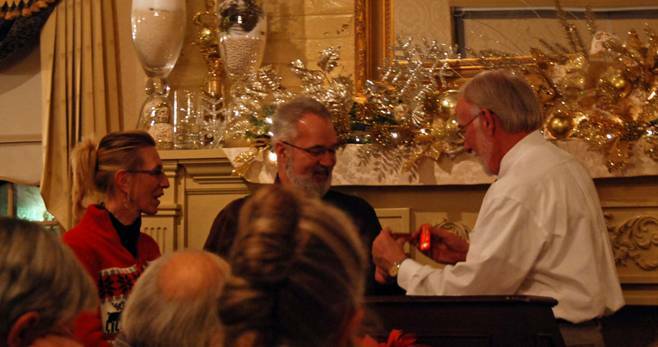 We settled on our designated charity for 2014 and we selected the Central PA Food Bank. They cover a 27 county area in central PA and are a worthy cause for LANCO to support. We’re looking forward to supporting them this year and their mission. We also voted to participate in the AACA Museum’s “Adopt a Car” program. 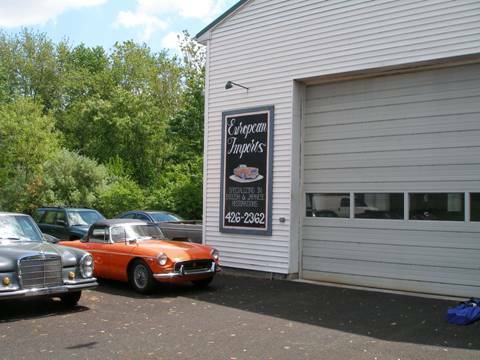 We’ll be adopting a 1963 MGB which was rumored to be the 1st MGB sold by Ladd Motors. We will hold a monthly raffle of 2 guest passes to the AACA to help fund the program for 2015. Our adoption will begin May 1st and continue for the next twelve months. I guess with our new addition we could pass out cigars, but oil dry is more appropriate……..lol! Dang, that was a busy meeting!! 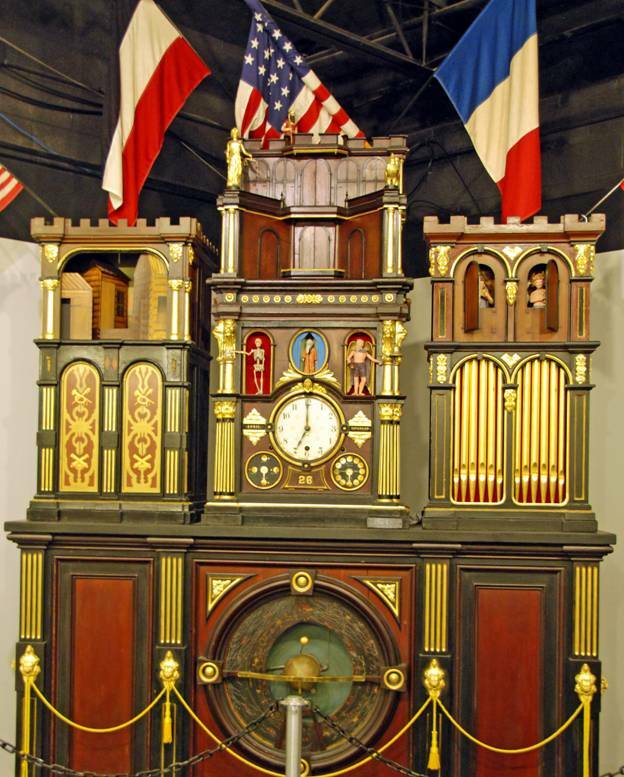 As we look ahead, we have our 1st road trip on Sunday, April 27th to the National Watch and Clock Museum in Columbia. 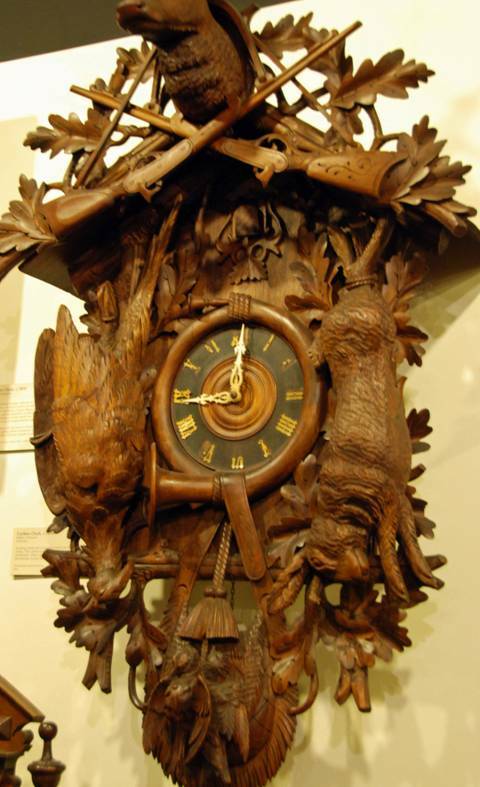 We’ll meet at the museum at 2PM, do the tour and then find some ice cream….so synchronize your watches…we’ll hold our annual tech session on May 18th at Tom Hertzog’s European Imports in Maytown. Concurrently we’ll hold a craft session at LEPCO in Marietta. Both sessions will start at 1:30 and we’ll all reconvene at LEPCO at 3:30 for a brief meeting and then off to McCleary’s for dinner. Not really a new event, but a more focused event is the Carlisle Import show on Saturday May 17th. We’ll be joining with several other clubs and share a tent at the event. Our participation over the past few years has dropped off and hopefully we can re-energize the attendance. Not to look too far ahead, but our June meeting will be on the 8th at the Cross Keys diner. We’ll meet at 2PM for a very short lunch/business meeting and then Skip will lead us on a tour of the Gettysburg Battlefield. This will be a great opportunity to see the battlefield and bug Skip with questions! 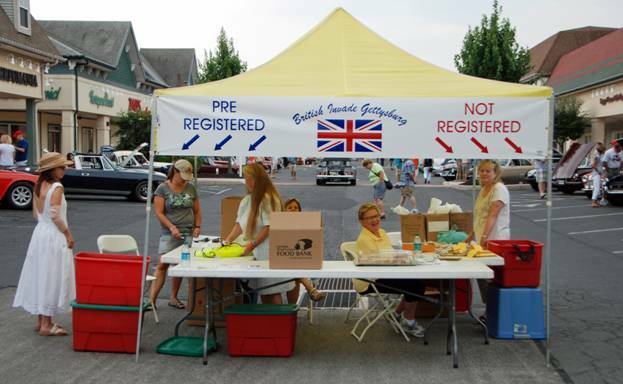 Of course, we have our British Invade Gettysburg car show on Sunday, July 1 th and our 25th anniversary Taste of Britain show on Sunday, August 24th. Both are really nice venues and excellent shows. 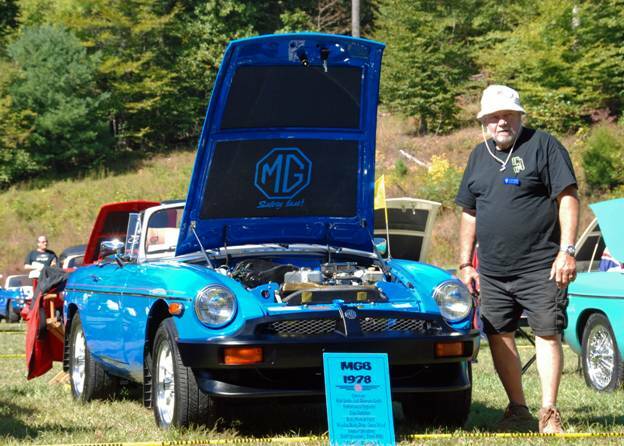 There is a lot going on this year with the LANCO MG Club including car shows, road trips, national events and good friends. I’m very proud of the club as we are reaching out beyond our scope. We’re helping the AACA museum, the Central PA Food Bank, working with other clubs at Carlisle and run two car shows. Sometimes it’s not the destination, but the journey that is important. If we or any club stay too internally focused, well then you’ve probably arrived at your destination. What do you do then? It’s really all about the journey, that’s what LANCO is doing. We’re on a collective journey to a destination TBD. Join us on our journey and check out our web site at www.lancomgclub.com and mark your calendars for the upcoming events in 2014. As the ad says, drivers wanted!! We kicked of our season’s 1st CCC on Saturday, April 5th at the Turkey hill Experience parking lot in Columbia. We had a robust attendance with 7 British cars and 11 cars in total. The hearty soul award had to go to Paul Miller as he showed up with the top down….kudos Paul. The real highlight of the event was watching the last of the snow piles melt in the parking lot. Our CCC event meets the 1st Saturday on the month at 9AM from April through October. It’s a VERY casual event, with no agenda. Just a good reason to get out early, drive your British car, have a cup of coffee and swap some stories. We’re out of there in about an hour so it won’t impact the “honey do lists”. Join us on a Saturday morning and check out our web site at www.lancomgclub.com . We do have some planned drives that will start after CCC. Mark your calendars. Well I’m writing this in advance of our May meeting, so I hope we all had a good time……instead, I’ll do some recap of the events to date. One of the many benefits of being president of the club and there are so many I won’t list them all…. is you get to schedule and plan the clubs events. 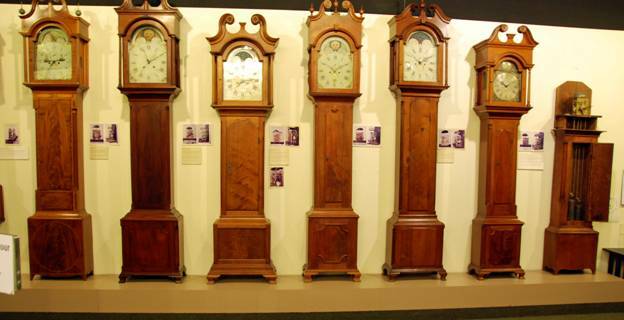 Sandy and I often talked about going to the National Watch and Clock Museum in Columbia PA but we never got there. So it was a self-serving plan, but I schedule the club for a tour on April 27th. We had 14 members attending the tour and the museum did not disappoint. It would take several visits to the NWACM to take it all in. The displays are well done and there is an impressive array of historical time pieces. If you missed the tour, I’d recommend it as a day trip, well worth it. We did find a place to get some ice cream after the tour and as I’ve learned during my tenure this IS a requirement! 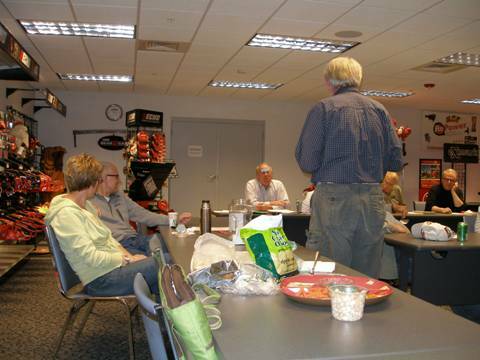 We did hold our second Coffee – Cars & Conversation on May 3rd with 10 members in attendance. The weather was great and we had a nice turnout of cars. 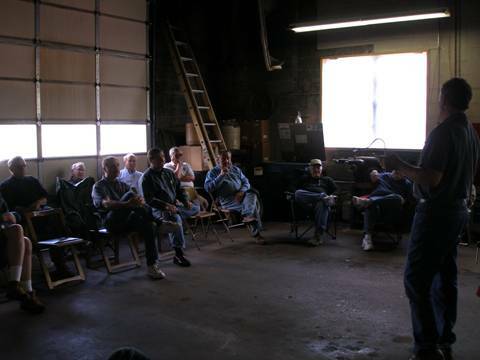 Had some competition with a gathering from the Corvair club, but we all got along and didn’t have to call Ralph Nader. 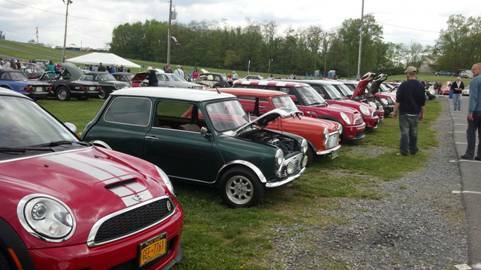 May will be a busy month with the Carlisle Import & Kit Nationals Show (May 16th – 18th). We’re sharing a tent this year with other clubs and hope to improve our attendance. On May 18th we will be holding our annual tech session at Tom Hertzog’s European Imports in Maytown, with a ladies program and a subsequent business meeting at LEPCO in Marietta – followed by dinner at McCleary’s Public House (also in Marietta). The June membership meeting will be held at the Cross Keys Diner on June 8th. We’ll meet at 2 PM for a VERY brief business meeting and then be led on a tour the Gettysburg battlefield by Skip P. I’m anxious to watch Skip drive, talk and take pictures all at the same time!!! 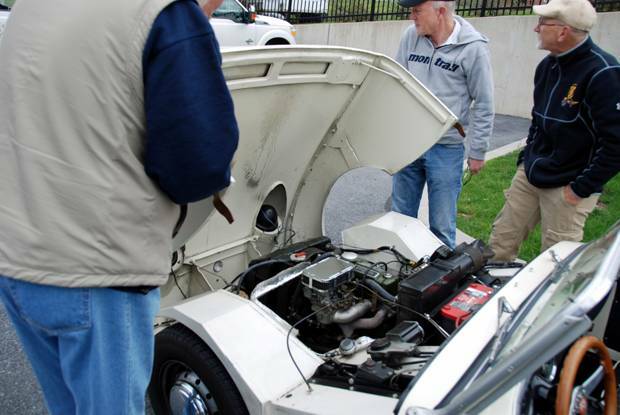 The club has finalized the adoption of a 1963 MGB at the AACA museum in Hershey. 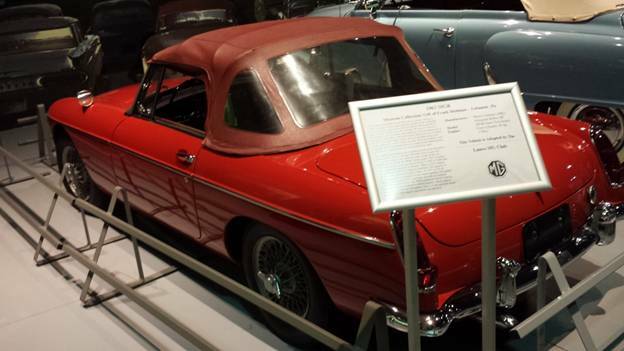 The car is reportedly the 1st MGB sold by Ladd Motors in Lebanon Pa. This provided a very nice historical touch for the adoption. The adoption program is a wonderful opportunity for any club to sponsor and help keep the AACA museum and the cars alive and well. Rusty Sellers was a pleasure to work with at the AACA museum. Plans are well underway for both of our car shows. "British Invade Gettysburg" (BIG) will be on held Sunday, July 13th. A big thank you goes out to Bob and Margaret for coordinating BIG. After BIG. Our next show will be "A Taste of Britain" on Sunday, August 24th. This will be our 25th anniversary of the show and should be good one. Again, a big thank you to Gloria and Larry for all their hard work in getting TOB ready. Also in June we have a nice caravan going out to MG 2014 in French Lick, IN and in July we have an intrepid group heading to the Pittsburgh Vintage Grand Prix and another group heading to NAMGAR GT-39 in Ottawa, Canada. 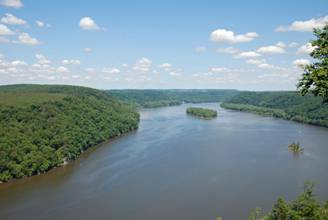 Lots to see, do, and for you to participate in with LANCO. Just a short soap box this month to stand on. I recently read a quote “it’s not failure that stops us, but the fear of failure”. I would be lying if I told you I didn’t have some misgivings about taking over as president of the Club in 2013. It’s a two-year commitment; wow that’s a long time! I didn’t feel I knew the membership as well as I should. I didn’t know the “club” as well as I should. Fortunately I didn’t let my fear prevent me from stepping up. If I had, I would have missed an absolutely wonderful opportunity to get to know MY club and its members better. I would have missed an opportunity to learn and grow with a great group of people. Besides I might not have gotten to the National Watch and Clock Museum…… So, what’s holding you back??? Steve D. and the British Marque staff have given me a gracious deadline so I’m writing this six days before it’s due. This is certainly a personal best, but not indicative of a pattern Steve! Since I don’t have to speak of future events, I’ll recap a very busy May. We had a successful outing at the Carlisle Kit/Import show. We did share a tent this year with other clubs and it certainly seemed to help attract more LANCO members. The consensus is we’ll do it again next year. The May 18th meeting/tech session and dinner was a success. A big thank you goes out to Tom Hertzog from European Imports in Maytown for hosting and presenting our very informative tech session. Topics included bushings, ethanol and additives, high heat paint, Dynamat, tires, lead additives, brake fluid … and more, We typically run about 90 minutes, but could go on much longer with all the Q&A time. Thanks again Tom. Sally Harbold and Sue Hurley coordinated the concurrent non-car tech session and, as always, did a great job. (The “ladies” made gift bags at their craft session.) Also, thanks to Tim Martin for allowing us to use the LEPCO offices in Marietta for the meeting. Finally, we did conclude the day’s events at McCleary’s Public House for dinner and some libations. Both met expectations. My biggest take away as president of the club is that while the business meetings are important, the dinner, conversation and fellowship are more important! Jim is ready for the Name Tag Drawing! This past Sunday, we held our June meeting at the Cross Keys Diner in New Oxford. The restaurant is always very accommodating and Judy does a nice job of following up after to insure we were satisfied. I did a VERY brief meeting so we could eat and head out for our Gettysburg battlefield tour led by Skip Paltrow. All went well until we were ready to leave and the weather looked less than promising. We made the executive decision to reschedule the tour to October. We missed our opportunity by one day as Saturday was picture perfect and we did sneak in a river run after the Coffee – Cars & Conversation. Again, Skip Partlow was at the helm for the tour. His co-pilot was Gloria Ciarrocca - so he couldn’t get too far off track. I wonder if Larry got the deck power washed……but I digress! All kidding aside, it was VERY good to see Gloria out and about! The CCC was the best attended event we’ve held. We had 15 people attending and a host of British cars. 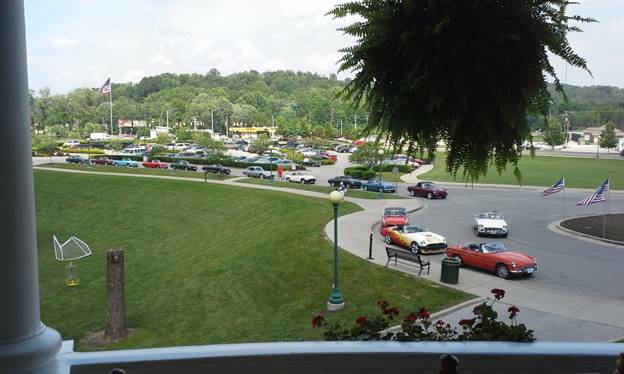 Now looking to the future; this Saturday we have four cars heading out to MG2014 in French Lick, Indiana. And we’ve got two cars on the road to Ottawa to attend NAMGAR GT-39 in July. In September we have a mini-fleet heading to Watkins Glen Iinternational with the possibility of a large caravan up Rte. 15. 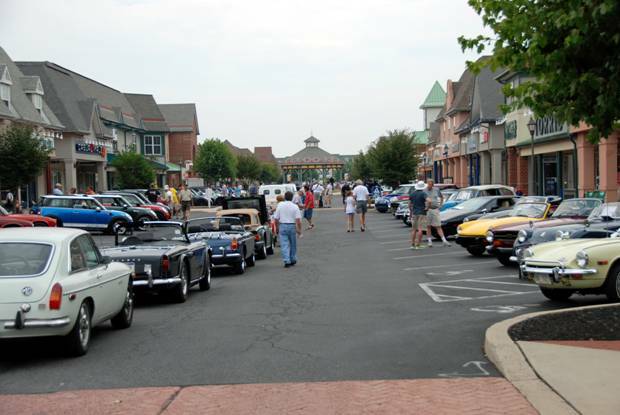 On the local front, we have our “British Invade Gettysburg” (BIG) car show at the Outlet Shoppes at Gettysburg on Sunday, July 13th (thank you Bob and Margaret Arlotto) and the 25th anniversary of our “A Taste of Britain” car show at the Forney Polo Field in Rothsville, PA. on Sunday August 24th (thanks Gloria and Larry C.). As a celebration to our LANCO volunteers, we’re inviting our honored guests to a chicken BBQ on July 29th at the Clipper Magazine Stadium in Lancaster. 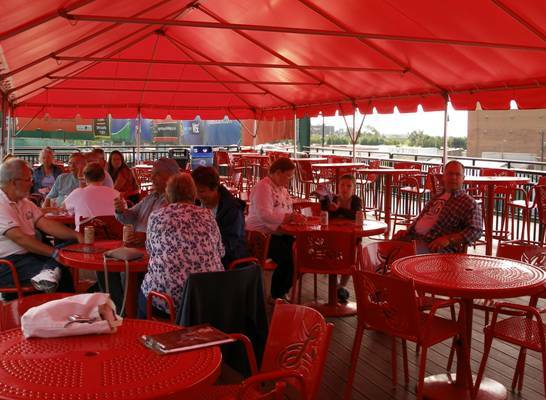 We’ll dine in the picnic area behind right field and then watch the Lancaster Barnstormers battle the York Revolution. Sprinkled in with all that, we have our Coffee – Cars & Conversation on the 1st Saturday of the month at 9 AM. We meet in the Turkey Hill Experience parking lot in Columbia for a very low key get together. Now, we all possess knowledge in a variety of fields and from life experiences. And in any club this knowledge is the real core of the club. But how we apply that knowledge and, more importantly, IF we apply that knowledge is what sets things in motion. What knowledge do you have; what can you share; and how can you share what you know is what will help keep our clubs alive and well. Don’t be a miser … share you knowledge and lend a hand. Ideas and thoughts are just ideas and thoughts and are lost if you don’t share them. Lots of activity planned for the summer months so remember to check out our web site at www.lancomgclub.com and mark your calendars for the upcoming events in 2014. 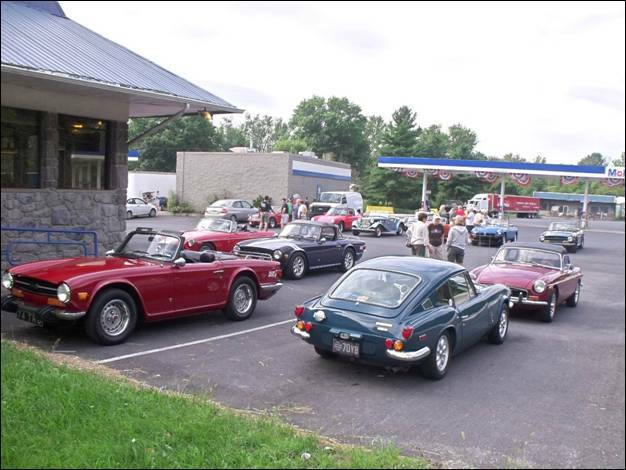 On Sunday, August 24, 2014, the LANCO MG Club will present the 25th Anniversary edition of “A Taste of Britain.” Come join hundreds of other owners of British Vehicles and Motorcycles at Forney Polo Field (on Church Street in Rothsville, PA) for a show AND a polo match. The Show Field Opens at 10:00 a.m. for Vehicles and the Polo Match starts at 2:30 PM for the coveted “A Taste of Britain” Cup. This is a “non-judged” show – just a fun gathering for all, with a portion of the proceeds being donated to local charities. Visit the LANCO website [http://www.lancomgclub.com] for a registration form, driving directions, etc. Pre-Registration Deadline is August 17, 2014. Special 25th Anniversary polo shirts are also available for preorder. It’s always better to be lucky than good and we were lucky yesterday, Sunday July 13th, for our British Invade Gettysburg (BIG) car show. The weather held off with no rain and was not unbearably hot like some years. It was humid, but per my no whining pledge after last winter, well 'nuff said!! We had 203 cars on “Main Street” at the Outlets at Gettysburg and it was an outstanding show. Kudos to Bob Arlotto and his family and all the LANCO volunteers for coordinating another great car show. We received lots of positive comments from the participants and everyone had a great time. We even had some British bikes participating – outstanding! Personally, I’d like to see more bikes participating in the British events. I’m not a bike rider, but they are such an important part of the British motoring history and hope we see more participating. Charlie B. had a great post show idea. 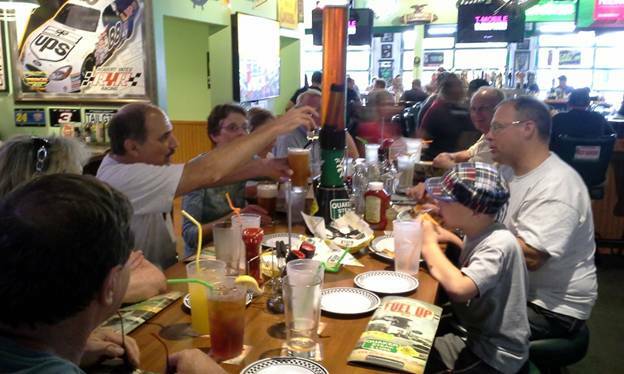 He suggested since most of us passed through York, PA on the way home, we should stop at Quaker Steak & Lube for some refreshment. The restaurant has a STRONG car theme and was hosting a cruise in and if you brought you classic ride you got a 15% discount. We had about a dozen members attend and had a great time. Now next time you see Charlie, ask him about the “lube tube”. Just a hint, it ain’t car related, but did help us to re-hydrate!!!!! Switching gears, we did have seven members (well actually 6-½ w/ Mark) attend MG 2014 in French Lick, IN. What an impressive venue! 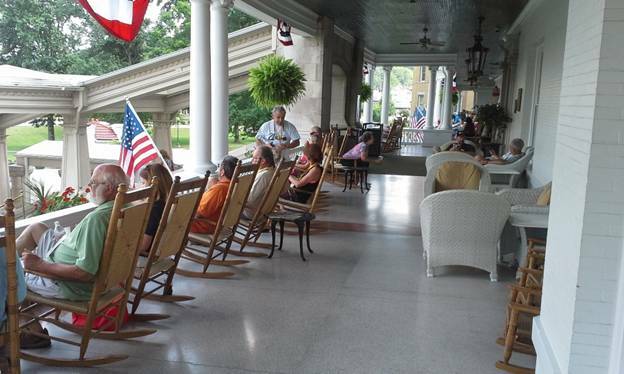 I could recommend the French Lick Resort as a vacation destination as it’s that nice. It was a great pace to hold the event as we were all in one location so lots of chances to mix it up with other MG owners. Nice work by the show organizers and the local sponsoring clubs. Now even if you won’t admit it, the fear of car issues on a long drive in a British car is always in the back of your mind. Well, the prince of darkness struck Skip and Ann in Ohio and they had to drop out the caravan to head back home. This is easy for me to say, but don’t let your fears keep you from driving. These cars are meant to be driven and enjoyed. The good news is Skip was at BIG in his MG and back on the road. Keep the faith Skip and keep driving. 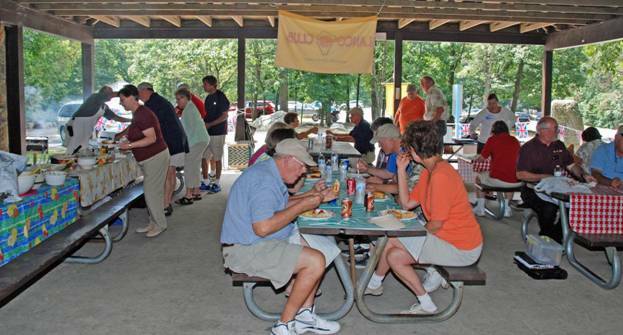 We had no formal meeting in July as we were at BIG, but our next regular meeting is the LANCO annual picnic on August 10th at Rocky Ridge Park. We also have our volunteer recognition BBQ on July 29th at Clipper Stadium in Lancaster. You’ll get a rare glimpse at Gloria’s fastball as she’ll toss out the first pitch…..film at 11!!! 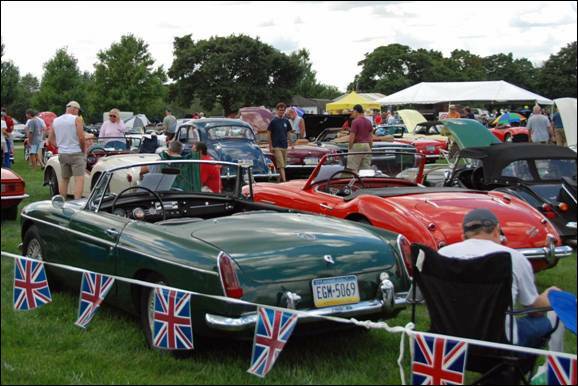 We also have our Taste of Britain car show on Sunday, August 24th at Forney Field in Rothsville, PA. This will be out 25th anniversary show and quite an accomplishment. Humm, maybe we can get Gloria to participate in the polo match? Now as it has become my tradition, I’ll step on my soap box. Life is all about change. Some we can anticipate and some is thrust upon us. There are only two things you can do with change, either manage it or be managed by it, your choice! I had some change thrust upon me in February and eventually had to make a decision to sell my 1970 MGB GT. Now I’ve been driving MGB’s since 1967 and this wasn’t a decision taken lightly. It was time to manage the change thrust upon me. I’m a car guy at heart and love all cars. 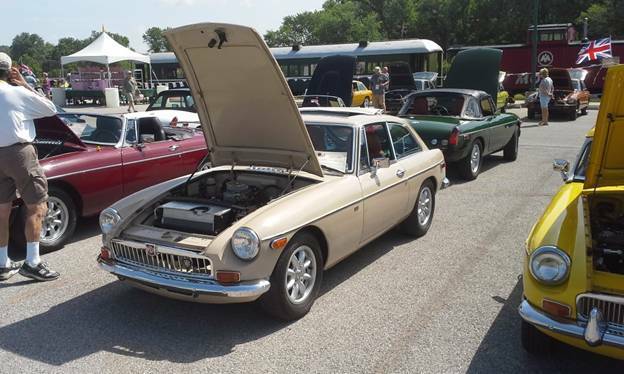 I’m especially fond of British cars, especially MGB’s, but all cars, nonetheless. So I sold my BGT (it has stayed within the club) and moved on to other sports cars. French Lick was somewhat bittersweet without having an MG there, but still had a GREAT time. Now believe me, I’m not suffering with the cars I drive, but still had to give up something I loved and invested 45 years of my life into driving, rebuilding and restoring. The key for me was managing the change, accepting the reality and moving forward. The trick is to not let the past direct your future. Manage the changes that will affect all of us at some point in our lives. It’s one of the reasons I continue to say, drive and enjoy you cars. Don’t wait for tomorrow, next week or next month! On a more macro level, how does this relate to our respective clubs? We’ll they like us, are changing and morphing. After all, they are made up of people! Recognize the change, adapt to the changing interests of the members and adapt to keep to keep your club active and alive. After all, we are ALL cars guys (and gals) at heart. The common interest that brings us together should be what keeps us together regardless of the changes. Celebrate and manage the changes in your life and club. Don’t let change be your taskmaster. Lots of summer activities planned so remember to check out our web site at www.lancomgclub.com and mark your calendars for the upcoming events in 2014. The LANCO gang set out on Saturday June 14. 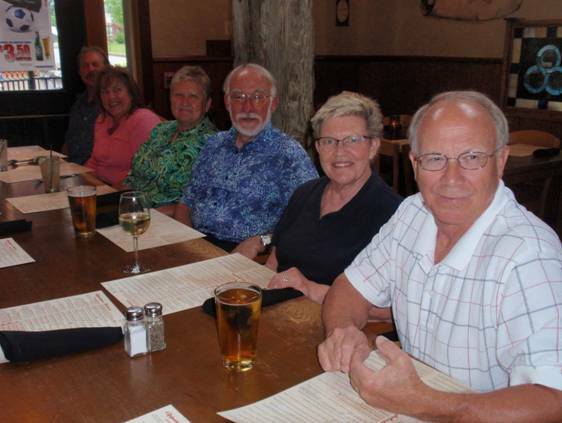 Our group included Skip and Ann Partlow, Ralph and Sandy Spay, and Jim & Sally Harbold. Scott and Mark Walter drove out on their own and Laura joined us on Wednesday. We traveled to Zanesville, Ohio for our first day. On Sunday we set out early. After three hours on the road - somewhere in Ohio - Skip lost all electrical power except the battery. After all heads were under the hood, Skip chose to use his Hagarty Insurance guarantee and was transported back to York, arriving about 12:30 AM. 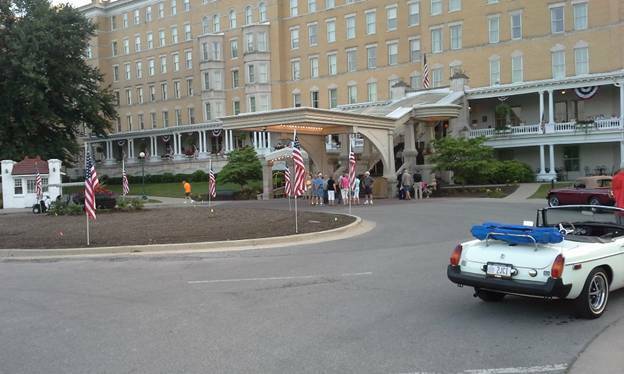 The rest of us traveled on to French Lick. The Resort was a beautiful, historical hotel with an unbelievable lobby, lovely rooms, gardens, shops and meeting rooms plus a convention center; another hotel - even more grand, a casino, and four golf courses completed the venue! We immediately ran into Scott and Mark in the lobby! Rocking Chairs for MG Drivers! Monday was filled with various tech sessions, both for the ladies and guys. After a 30 minute drive, we had a dinner at a beautiful state park. We ended our day by checking out the hospitality suite on the rooftop! Tuesday included more tech sessions, a scenic train ride, a wine tour, and dinner at O’Charley’s, a local pub. Wednesday was the Car Show - on a black-top parking lot in 93 degree heat. We managed to cool off in the casino! There were a lot of beautiful cars and, although LANCO came away empty-handed, we did enjoy a wonderful banquet to end our day. Thursday we started our drive home - some drove straight through and others took two days. All in all, probably our grandest convention experience at a beautiful venue! Let me see, where to start ... well, BIG is behind us and Taste of Britain (TOB) is well in hand with the final plans. The event will be our 25 th anniversary show on Sunday, August 24th. The car show field will open at 11 AM and the Polo match will start about 2:30. As in past years, we’ll present the LANCO Cup to the winning polo team and will also present a memorial tribute to John J. Moran II. 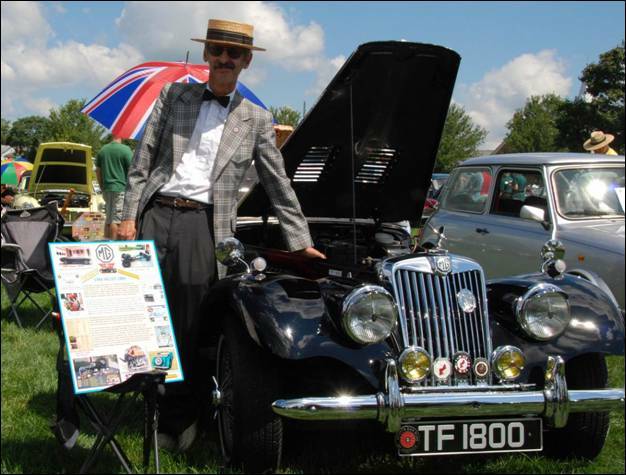 John was an avid British car fan and a member of the Lancaster Polo Club and will be missed. July was a busy month with car shows and road trips. We had a nice caravan out to PVGP. Saturday was damp and cloudy and some of the group was, well more adventurous then others. But Jim, Sally, Ralph and Sandy did get their lunches! In fact, Jim and I enjoyed a plastic cup of vintage box wine at the show. Dale and Claudia trailered out their Mini, as Mini was the featured marque. They hoped to come home with an empty trailer, but it followed them all the way home! We did have some winners at the British show as Gloria and Larry Ciarrocca, Jon and Edie Arndt, and Bruce Bubeck all were winners. Bill and Jack Butler trekked to Ottawa Canada, but decided to leave early as Bill was putting in a pool in his basement…..ask them for details, not pretty! Our volunteer recognition BBQ on July 29th was a huge success. Remember all you need to do is be a volunteer at a club event and you get a free night out. What a deal…. We held out annual summer club picnic at Rocky Ridge Park on August 10 th. The weather was great and so was the turnout with 43 members attending. Our cooks, Larry and Mike did an outstanding job and Sally and Kay did an excellent job planning. Thanks to everyone who helped set up/tear down and brought covered dishes. No one went home hungry! 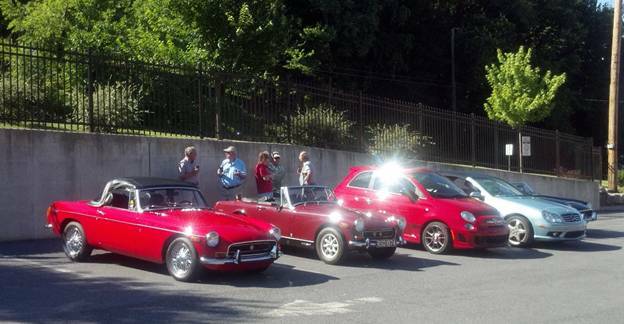 We held our monthly Coffee – Cars & Conversation on August 2nd. We had another good turnout and met some new faces and cars. This is an excellent event that takes minimum planning and gives you a reason to go out and driving your car. It’s a win, win scenario for everyone. We have two more CCC’s planned for the season and the last one on October 4th we will be gathering and head to the Gettysburg Battlefield. We’ll post the details on the club web site. Speaking of the web site, remember to check out our web site as we have a change for the October crab run to Woody’s in North East, MD. The NEW date is October 19th. We’ll meet at 11 AM at Musser’s Market on Friendly Drive at Buck, PA (Intersection of PA 272 and 372). Well it’s that time to step up on the soap box and ramble. I must admit I actually enjoy writing these missives. In past months, I’ve written about my Bugeye and losing my way with the car. Last month was about change and either manage it or be managed by it. Well, my Bugeye project is progressing with the wiring, dash, gauges, and lots of other stuff all installed AND working. Hope to drop in the engine in the next several weeks. So what have I learned from all this car stuff and change and how it relates to life? First, find and know what you’re passionate about. I’m a car guy. I love all kinds of cars. I’m blessed to own three very different sports cars. All provide different driving experiences and one is not better than the other. Change forced me into this one and I have no regrets, just rolled with it. Differences can be celebrated and enjoyed, not judged. Change doesn’t mean you have to lose your passion. Second, these are just cars and are meant to be driven. It’s taken me a long time to reach this point. I’ve discovered they won’t melt in the rain. But just like people, they require attention and TLC to fully enjoy. Enjoy what you have today and take care of it. Third, know your limits both mechanically and physically. You can’t know or do it all, although you might believe it! Some things on the car I won’t tackle. I have no interest in knowing the inner workings of my differential or transmission or running 26.2 miles and yet I’m still a good person. Asking for help will not diminish you. Fourth, do it right or do it again. Ever take the short cut on a car repair or project and then something usually comes back to bite you in the boot (aka trunk)? And you get to do it again, correctly and sometimes more costly. Cars and people are so intertwined it would be tragic if we couldn’t learn some people skills from them and then apply that knowledge. After all, knowing something and not applying that knowledge is a wasted opportunity to share or help someone. Remember, there are still plenty of summer activities planned with LANCO so check out our web site at www.lancomgclub.com and mark your calendars for the upcoming events in 2014. LANCO goes to PVGP! by Sally Harbold, photos by Gloria and Larry Ciarrocca. 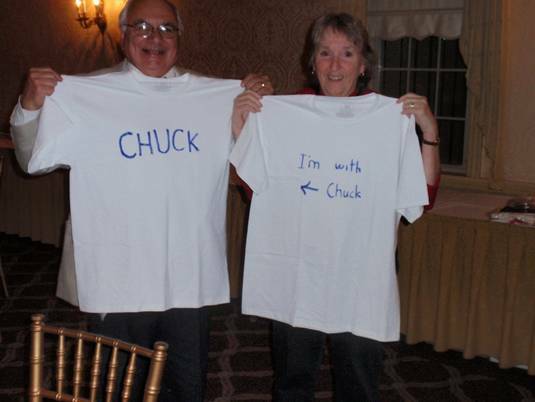 The LANCO gang this year included Jon and Edie Arndt, Larry and Gloria Ciarrocca, Dale and Claudia Glatfelter, Jim and Sally Harbold, and Ralph and Sandy Spayd. We had great weather (compared to last year!) 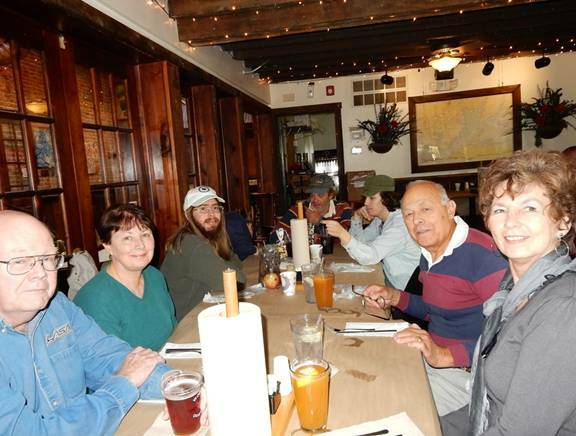 and made our usual stop for a great lunch at the Jean Bonnet Tavern. We arrived in Pittsburgh with no problems! We all went our separate ways for dinner and got back to the hotel before the rain began; it poured all night and Saturday morning. The cars were delayed entry onto the field for two hours. About noon, the weather cleared and the show went on as usual! LANCO garnered three awards; Gloria Ciarrocca - 2nd in Chrome Bumper MGB; Jon and Edie Arndt - 3rd in Jaguar; and Bruce Bubeck - 2nd in Lotus. 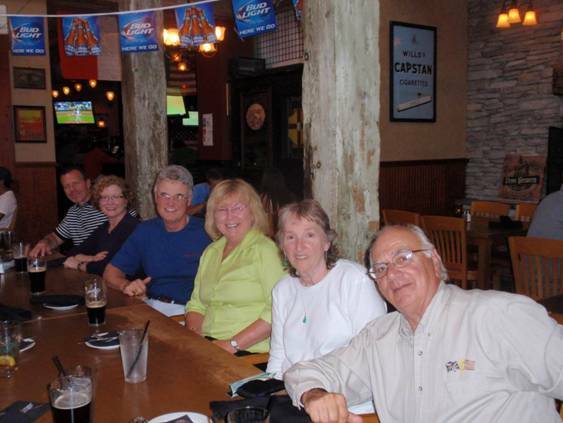 Saturday evening we gathered in the lobby and took the hotel shuttle to Claddagh’s Irish Pub for a great dinner. 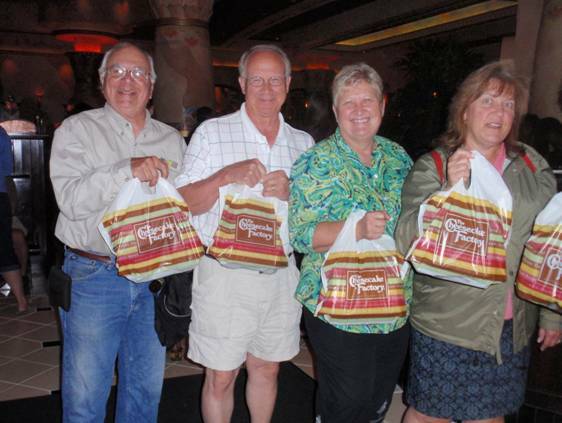 Since we were just across the street from The Cheesecake Factory, we just had to get dessert to go! What a hard choice to pick just the right flavor! Sunday morning we lingered over breakfast at Panera. Some folks chose to hit the road for home while others headed to the races. It was again a great trip, with good friends, and no mishaps! 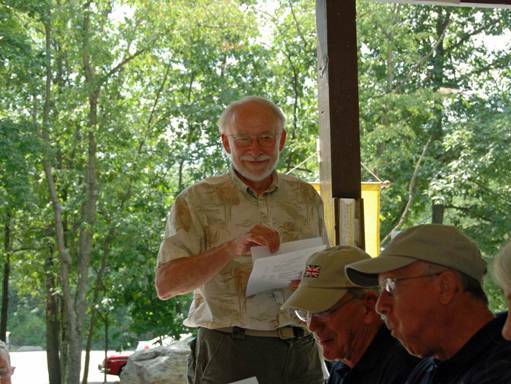 LANCO Volunteer Recognition BBQ by Ralph Spayd, photos by Steve Dellinger. The LANCO MG Club held its volunteer recognition event at the Clipper Magazine baseball stadium in Lancaster PA on July 29th. 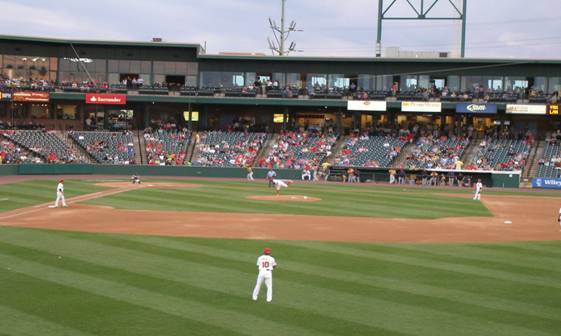 The group was treated to a chicken BBQ and watched the Lancaster Barnstormers battle the York Revolution. We had 23 members and guests attending and had the honor of watching our club founder Gloria Ciarrocca deliver the first pitch. Now Gloria worked on her fast ball for weeks and it showed…..not sure what it showed, but seriously Gloria did an outstanding job and handled the pressure well. The next meeting is September 14th. You have to attend and be wearing a name tag to win. It’s in the books, and “A Taste of Britain” (TOB) was a huge success. 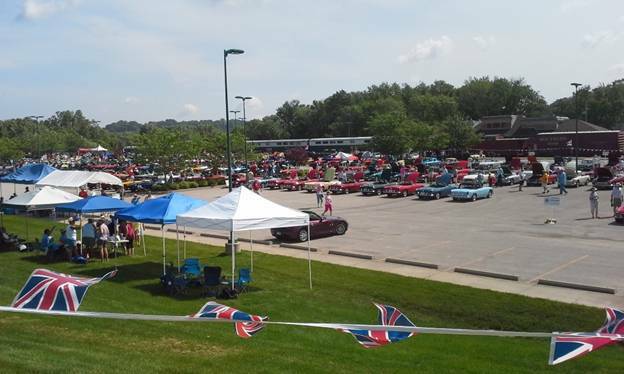 It was our 25th anniversary celebration of the car show and we had 200+ cars on the field. As is the tradition, we presented the winning Polo Club with the TOB Cup. 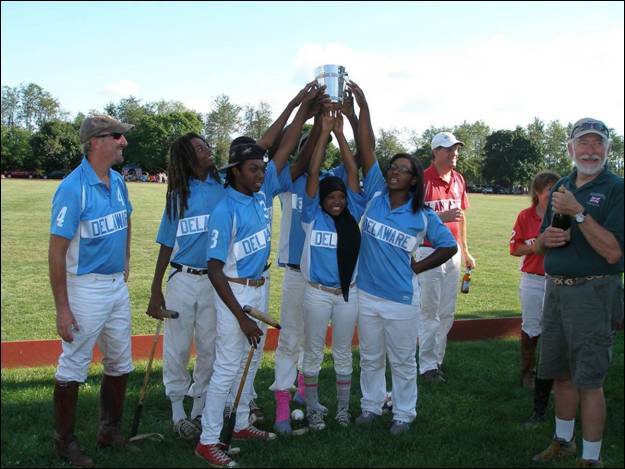 This year the Cup was presented to the Delaware Polo Club, with their win over the hometown Lancaster Polo Club. Since it was our 25th anniversary, LANCO sprung for champagne for the celebration (not to worry; it wasn’t the expensive stuff – and no one underage got any!!). 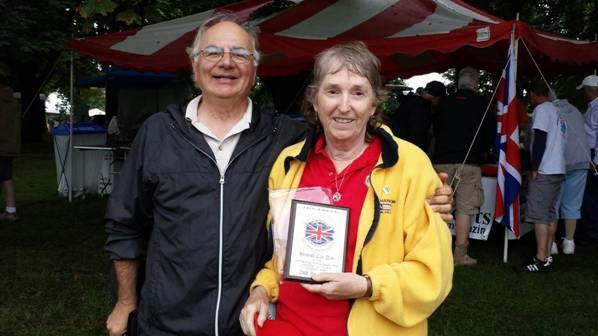 Prior to the start of the match we presented our club and TOB founder, Gloria Ciarrocca, with a plaque honoring her for her tireless effort to the club and the “A Taste of Britain” car show. We also presented a plaque to the Lancaster Polo Club honoring and dedicating the match to the memory of John J. Moran II. John was a member of the Lancaster Polo Club and a British car enthusiast and his presence will be missed by all. Thanks to all the LANCO volunteers who helped to make the 25th TOB a success. The past month was again very busy with car shows and a caravan to Watkins Glen. This year MG was the featured marque at WG and LANCO was well represented. Thanks to all who participated and especially to Charlie Baldwin for coordinating the trip. Since the editorial deadline is before our September club meeting….I’m sure we all had a good time on the 14 th at Annie Bailey’s in downtown Lancaster. Speaking of future events, we have some club-planned activities. There is the Stowe, VT “British Invasion” on September 19th. We have our annual LANCO club run to Woody’s in Northeast, MD on October 19th. 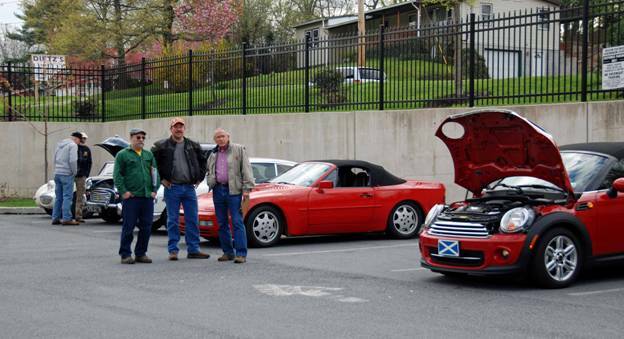 (We’ll meet at 11 AM in the parking lot of Musser’s Market, 35 Friendly Drive, Quarryville, PA.) Our last Coffee – Cars & Conversation of the year is scheduled for October 4th at 9 AM in the Turkey Hill Experience parking lot in Columbia. Weather permitting; we’ll take off for a Gettysburg battlefield tour from CCC. We’ll also be attending the C4Life car show on September 27th at the Lancaster Liederkranz. 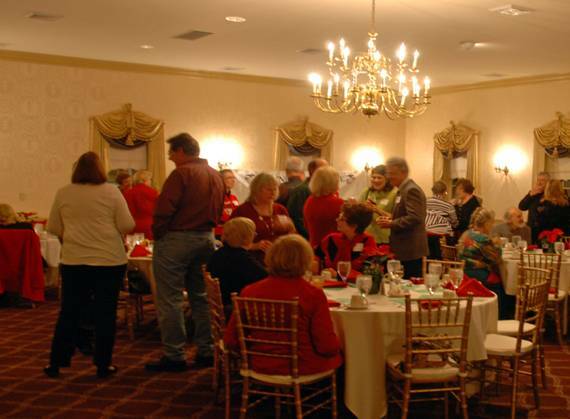 We have our last club meeting for 2014 scheduled on Sunday, November 9th at Fiorentino’s Restaurant at the Lancaster Airport and our annual Holiday Banquet on Saturday, December 6th. I can’t believe we’re talking about the end of year events! This is a good lead into the monthly soap box. I have enjoyed my 2-year term as club president immensely - but will be stepping aside after December. I will still be an active participant and plan to lead club drives and events. With that said, the club is looking for leadership. My only regret during my tenure is I have not been able to motivate a successor. I’m confident we’ll select a leader, but in all likelihood it will be someone who has already held the “reins”. Our club, like other car clubs, continues to run into trouble finding new leadership. Leading your club is neither difficult nor a chore. It’s something you’re already interested in, something you care about and something you can do. It really does not take any Herculean effort to lead. There are many, many willing hands to help you. Don’t wait to be asked to help, step forward and offer your help. Remember it’s communication and communication is a 2-way street - with a sender and a receiver. Lectures are only one directional……and that’s a good place to stop for this month. Remember, there are still lots planned with LANCO so check out our web site at www.lancomgclub.com andmark your calendars for the upcoming events in 2014. Watkins Glen, Stowe, MGs On the Rocks, Hunt Country Classic, C4Life Celebration and Coffee – Cars & Conversation were just some of the events LANCO members attended over the past several weeks. We’ve has a very busy fall season. Actually fall is one of my favorite times to drive my car. The weather is very pleasant and you’re neither “cookin’” nor “freezin’” as you drive your car. There is a lot to appreciate this time of the year with pleasant temps and the fall foliage. Of course, spring isn’t bad either and summer is also nice…guess I just like to drive my car! What we failed to pull off for a second time was our Gettysburg Battlefield tour after the October CCC gathering. The weather again proved to be difficult, and we cancelled the run. The good news is the battlefield will be there next year and so will we! There is still some life in this year’s calendar and as you read this we will have concluded our annual crab run to Woody’s in North East, MD on October 19th. 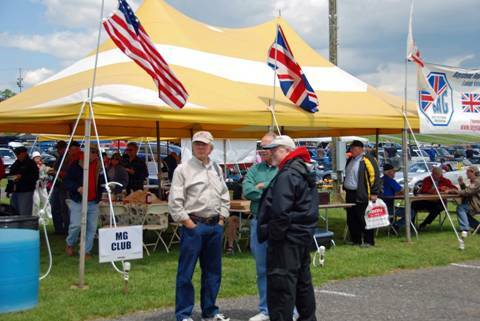 We have a record number signed up this year and have invited the British Car Club of Delaware to join us. I’ll gamble on this and predict we had a great time. 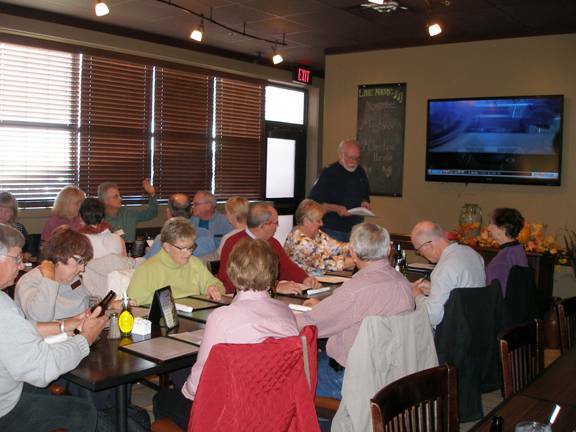 Our November club meeting is scheduled for the 9th at 3 PM at Fiorentino’s Restaurant at the Lancaster Airport. 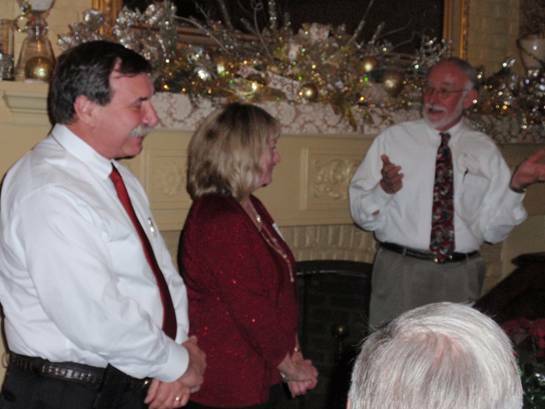 Our annual holiday banquet is on December 6th at the Fireside Tavern in Strasburg. We’ll have a cash bar at 6 PM and dinner at 7 PM with awards, recognition and some “gentle” roasting of club members and a review of notable events from the year. We have begun the planning process for 2015 and are looking to streamline and simplify the club meetings next year. We will limit the number of venues where we hold our meetings and plan to host a joint meeting with other British Car clubs. We need to promote/generate more synergy within the British car club community and the joint meeting will certainly help us to collectively share our plans and start the process. We’ll be hosting both our car shows (BIG and TOB) again in the coming year and our Coffee – Cars & Conversation events will kick off again in April. Another great year is planned for LANCO and our members - so stay tuned. Well since I’m out of ramblings and calendar stuff….I’ll step on the soap box. Legacy - what will this club leave or any club leave in its wake? Are we just about our British cars and driving them? Working on restoring, repairing and keeping them running - or is there something more to any club. If it’s only the cars we’re all about, it’s a very transient “thing” and we’ll leave nothing, but oil marks in the driveway. 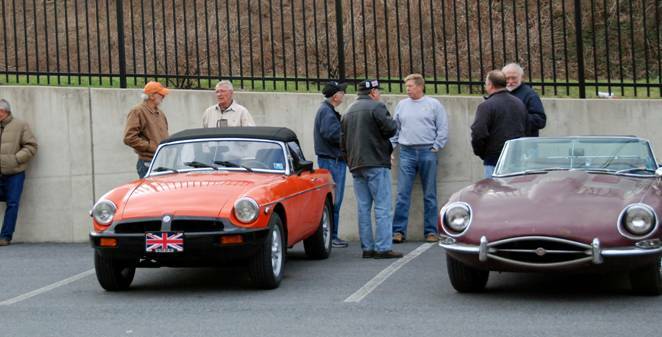 The LANCO MG club is very fortunate to be comprised of many caring people who are able to think past their cars and give their time to support community groups and charities. Our support ranges from the Adopt a Car sponsorship with the AACA, to donations to the C4Life campaign and the Central PA Food Bank. The monies we raise through our two car shows support these activities. I believe our “legacy” is not just in the cars we drive, but in our spirit of giving and preserving the heritage of the British cars we all love. 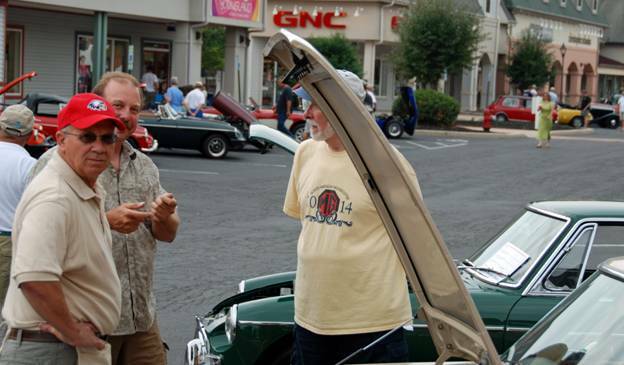 We’ll never know who or how we might touch someone through the car shows we run or the donations we contribute. But what we do know is if we did nothing we are sure to help no one and that’s not a legacy we want to carry forward. Our car club membership is in transition as we sell/trade the cars we drive, but our legacy is our constant and something we can and do all own. Something we should all be proud of. Remember to check out our web site at www.lancomgclub.com and mark your calendars for the upcoming events in 2015. 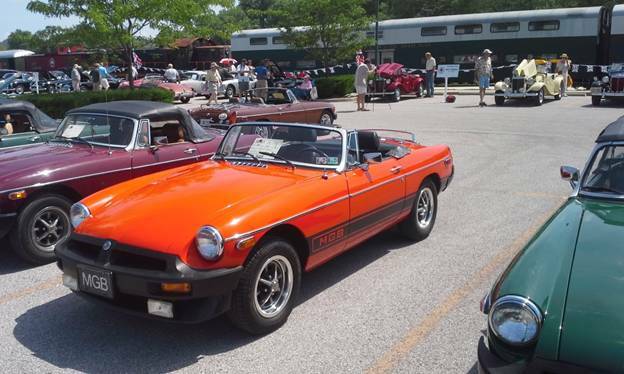 On Saturday, September 27th, nearly thirty LANCO MG Club members attended the annual " MGs on the Rocks " British Car Show, which is hosted by the MGs of Baltimore. Well my prediction from last month was right on. 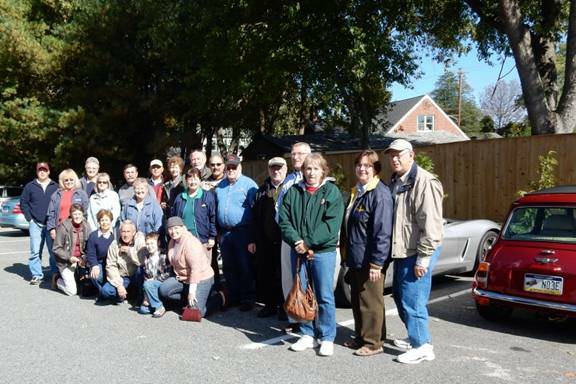 We had an excellent turnout for the annual crab run to Woody’s in North East, Md. In fact, we had 31 attending the event. 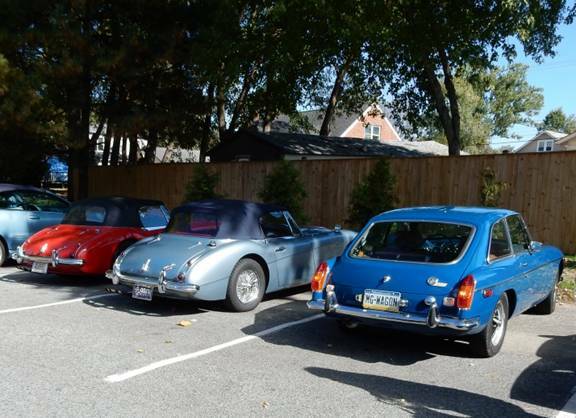 This year through the effort of Charlie Baldwin, we invited the British Car Club of Delaware (BCCD) to join us. They met us at the restaurant and had 7 members attending. As always, a good time was had by all and the weather was perfect. A big thank you goes out to Larry and Gloria Ciarrocca for coordinating the event and Gloria’s very thoughtful gift bag of goodies to all attending. 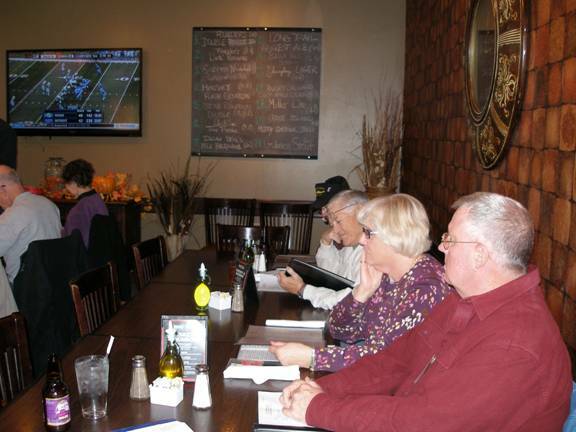 The activity calendar is winding down for 2014, but we had a great meeting on November 9th at Fiorentino’s restaurant. We had to move to a bigger dining room to accommodate the 30+ members attending. I’m sure it was my “riveting” meeting agenda that drew the large crowd but possibly it was the decision to raffle off the name tag drawing pot of 100 dollars. [Editor’s note: the “riveting” meeting agenda lasted all of eight (8) minutes]. We’ve somewhat struggled with name tags this year sooo to be safe, we handed out raffle tickets to make sure no one was missed. It worked like a charm and the club gave out two $50 cash prizes. Our lucky winners were Sue Hurley and Ann Partlow. Both winners were gracious in their acceptance. Our third place winner was Sally Harbold, but unfortunately, we were out of cash……how’d that happen as Jim is the Treasurer. I’m sure they worked it out on the ride home! The meeting locations for 2015 will be streamlined to minimize our shuffling around. We’re planning a joint meeting with the other local British car clubs in June and we’ve already got a large contingent signed up for MG2015. 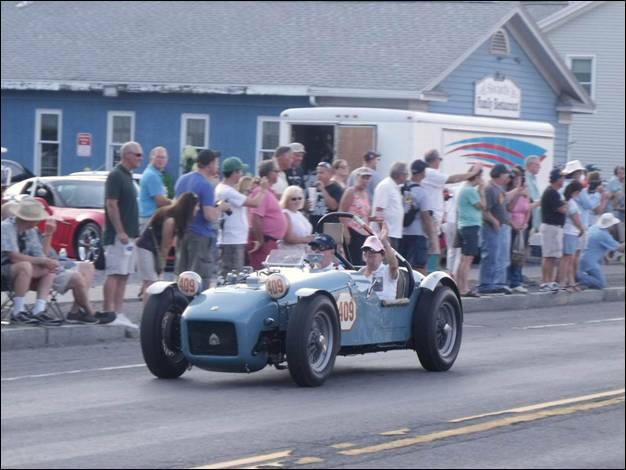 Sprinkle in Coffee – Cars & Conversation, Watkins Glen, PVGP, car shows, a tech session and some local drives and tours and it looks like another banner year. I’m ready for spring, oh yah, the problem is we haven’t had winter yet……whatever!!!! As has become my tradition, I’ll now step on the soap box. This is my last British Marque article as President. I’ve thoroughly enjoyed writing these rambling bits of the clubs goings on and my chance to share my thoughts. It has truly been my privilege to serve the LANCO MG Club as its President. It was not a difficult task but was made much easier by all the help I received from my board of directors and many club members. Thank you for all your support. This is very true for our club or any organization. We’ve all seen clubs come and go. They’re on top and active for a while and then fade into just a memory. Typically because they could not or would not change the “load” they carried. LANCO will need to change and streamline as we move forward and age. You’ll see some changes in TOB for 2015 and our meeting location will be streamline for the coming year. It’s all good and part of the club aging process. If we don’t manage our change we’ll be managed by it and eventually become just a memory. That’s not something we want to happen. We’re a special group of people with a shared interest/passion for British cars. That’s something that doesn’t change over time, but how we approach our interest and keep it alive will certainly change. All good stuff as we move forward into the future together. Again, thank you for allowing me to serve the club and remember to check out our web site at www.lancomgclub.com and mark your calendars for the upcoming events in 2015. 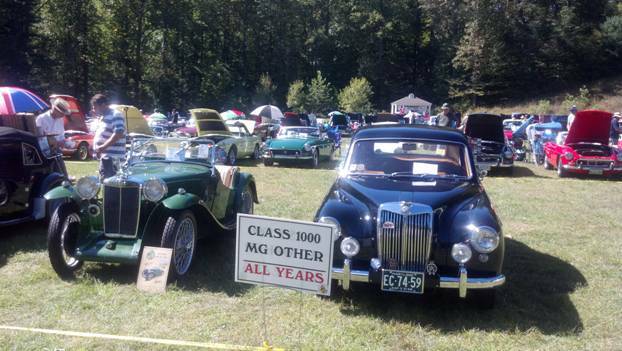 Last month we listed the LANCO Club members winning awards at the annual " MGs on the Rocks " British Car Show, which is hosted by the MGs of Baltimore. 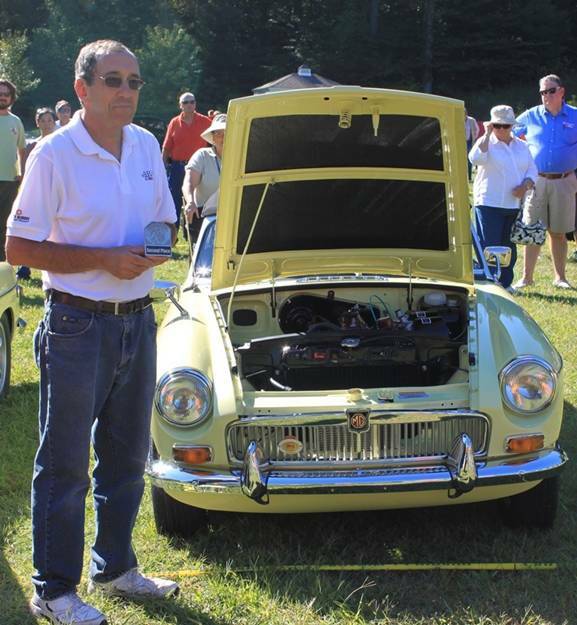 However, we missed one: Ed and Sue Katz took 2nd Place, MGB Roadsters 1968-1974, with their 1969 Yellow MGB. Sorry Ed!! 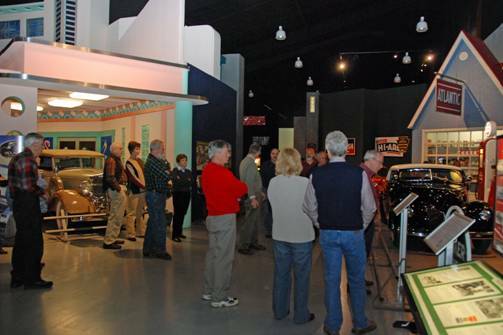 Several weeks ago Gloria and Larry Ciarrocca visited the Antique Automobile Club of America (AACA) Museum in Hershey. 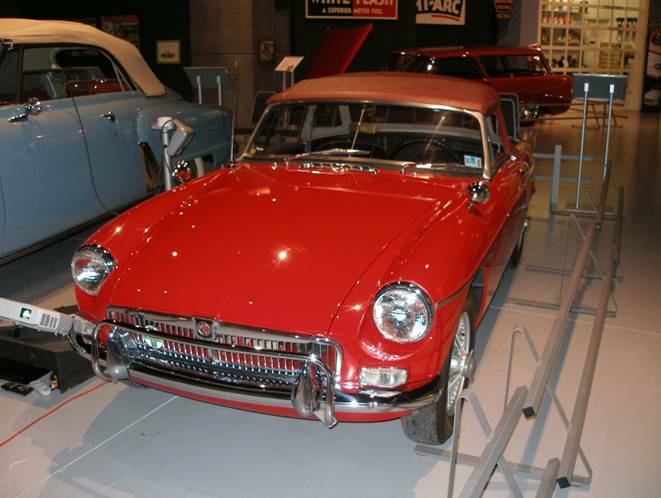 In addition to visiting the new Tucker exhibit, they stopped by to visit the LANCO-sponsored 1963 MGB – which was sporting a plaque stating that “This Vehicle is Adopted by The Lanco MG Club”. 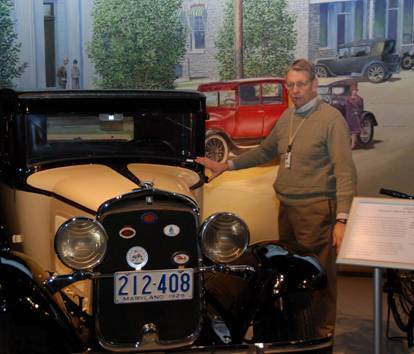 The car was adopted through the AACA Museum’s “Adopt a Car” program. Our adoption began on May 1st and will continue though April 2015.